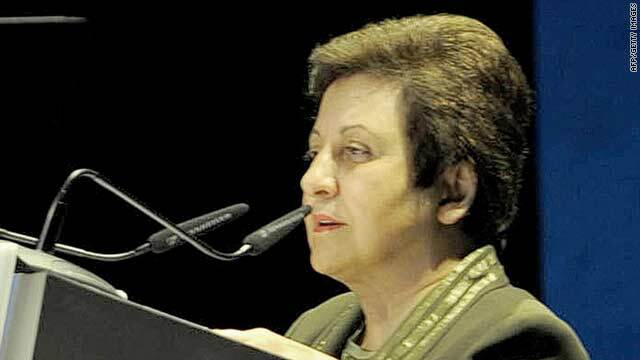 Iranian Nobel Peace Prize laureate Shirin Ebadi gives a speech at the "Festival of Thinkers" in Abu Dhabi, United Arab Emirates, on November 2. (CNN) -- Iranian intelligence officials have detained the sister of Nobel laureate Shirin Ebadi, the Iranian lawyer and human rights activist said. Ebadi said Monday that three men and a woman arrived at the Tehran home she shared with her sister, searched the house and seized Nushin Ebadi, 47, and her computer. "They have detained her so I stop my work," Shirin Ebadi, 62, told CNN's Reza Sayah in a phone call from London. "She has done nothing wrong. She's not involved in human rights work, and she's never participated in any of the protests." Nushin Ebadi's arrest came in the middle of a deadly crackdown on anti-government protests that has left at least eight dead, according to the Supreme National Security Council, although the Iranian government denies its forces have killed anyone. Shirin Ebadi, who won the Nobel Peace Prize in 2003 for her human rights work, left Iran for a conference in Spain the day before June presidential elections that sparked an earlier round of violent protests. Friends, she said, warned her not to return to Tehran. The Nobel laureate said she spoke with her sister Monday, a few hours before the 9 p.m. visit by ministry officials while Nushin Ebadi was at home with her husband and two sons. Iranian Information Ministry officials contacted Nushin Ebadi several times previously, her sister said, telling her to leave their apartment and warning her not to contact her sister. Both women thought those demands were absurd. They have detained her so I stop my work. "Not only does my sister not do any human rights work, she doesn't do any cultural work either," Shirin Ebadi said. "They only took her because of me." Shirin Ebadi's law firm represents seven members of Iran's Baha'i Community who have been charged with espionage. She said she is certain Iranian officials are trying to intimidate her by harassing her sister, but, she said, she will not back down. "They want to intimidate me," she said. "The only thing they want is for me to change my work." "I am worried. I'm worried because she [Nushin Ebadi] was detained because of the work I do," she said, adding it was that work that made Nushin a target. "She's not interested in this kind of work. She's not involved in this kind of work." Shirin Ebadi said she advised her sister to contact an attorney when Information Ministry officials first began approaching her and that she did so.